More than 50 people came to the Cittie of Yorke for our special Brain Awareness Week event co-organised with Cosy Science. 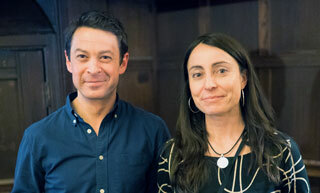 Martin Meyer and Beatriz Rico discussed major ongoing questions in the field of brain research: how the brain develops and how it treats information from the outside world. Brain Awareness Week (BAW) is the global campaign to increase public awareness of the progress and benefits of brain research. Founded, and coordinated, by the Dana Alliance for Brain Initiatives and European Dana Alliance for the Brain, this event brings together partner organizations worldwide in a celebration of the brain for people of all ages. This year, in collaboration with Cosy Science, the Centre organized an evening of informal and exciting scientific discussions on how our brain develops, how it’s wired, and what happens when some of this goes wrong. Beatriz Rico first explained the different steps required for building the brain during embryonic and postnatal development: how the different types of excitatory and inhibitory neurons are born, how they migrate to their final destination and how they eventually integrate and wire to form the highly complex circuitry of the brain. Martin Meyer then talked about his main research question, which is understanding what the eye tells the brain. He described how the retina sends information about the visual world to the brain. However, our brain receives an incomplete representation of the world and has to interpret new information and to compare it to stored information. This point was proved by optical illusions presented to the audience on printed handouts and everybody got it wrong! Both talks led to many questions during the Q&A session. Some people asked questions about the different methods and models that are currently used in the lab to study the brain. We also discussed about neurodevelopmental diseases and how the environment can impact the very tightly regulated development and maintenance of our brain. Don’t worry if you missed it, you can listen to both talks on KEWO’s website (Beatriz's talk and Martin’s talk).